The World Resources Institute has developed Aqueduct, an interactive mapping tool that offers a fascinating look at water-related risks and stresses, including projected impacts due to climate change. Using global data donated by Coca-Cola, one of several heavyweight corporate partners (Goldman Sachs and General Electric founded the Aqueduct Alliance), WRI has analyzed and visualized a dozen water-related risk factors facing businesses, governments, and communities. 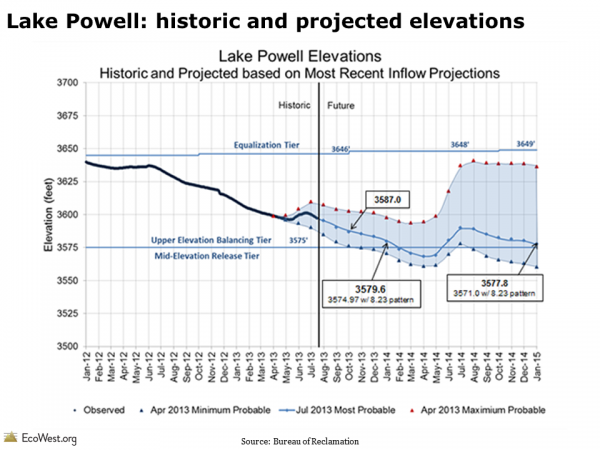 Below is a view of overall water risk (click to enlarge). 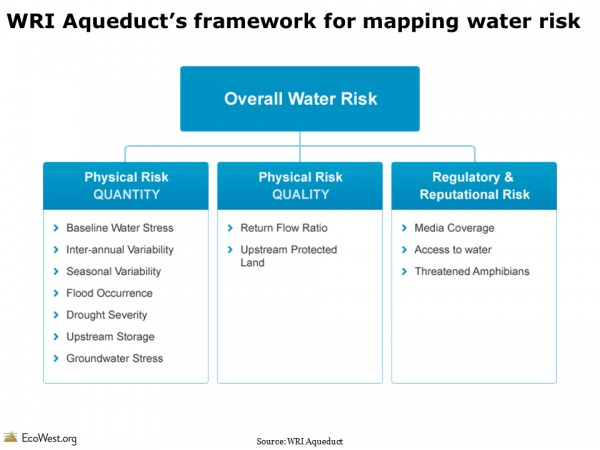 Aqueduct’s water risk model includes a dozen components, as shown in the slide below. 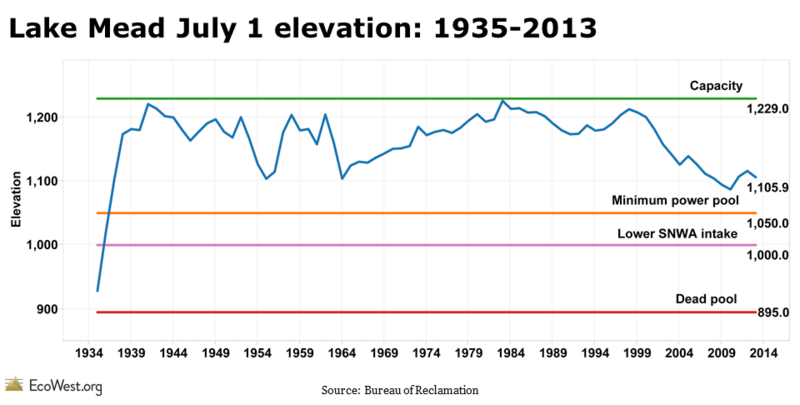 The physical quantity risks deal with questions of supply, such as a location’s climate and its susceptibility to drought. 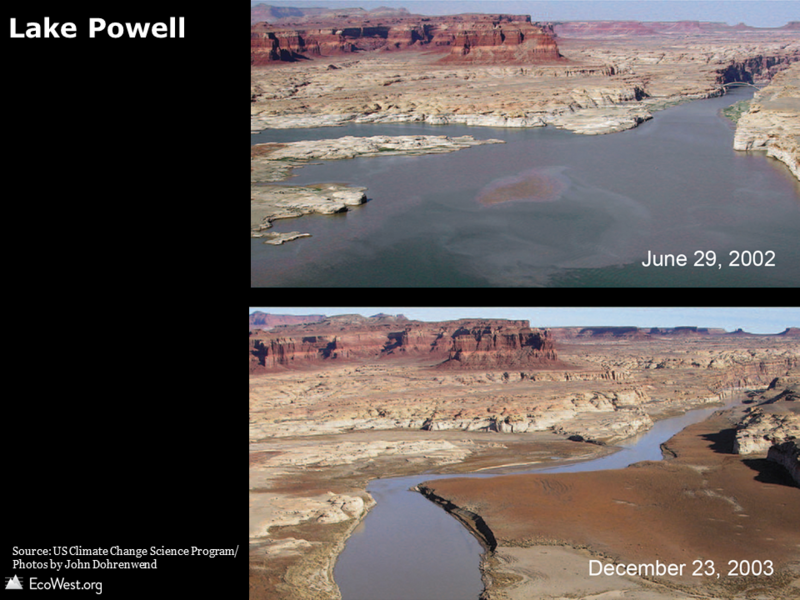 The physical quality risks revolve around pollution, such as the protective status of upstream watersheds and how many times river water is re-used. The final category, regulatory and reputational risk, uses proxies, such as the number of threatened amphibians to highlight more fragile ecosystems that may face restrictions on withdrawals. There’s even a measure for media coverage of water issues to indicate where businesses will face greater risks to their public image if they do not manage water sustainably. In the online atlas, you can examine each of these dozen factors separately and weight the three categories according to the needs of industry groups, including agriculture, semiconductors, and oil and gas. 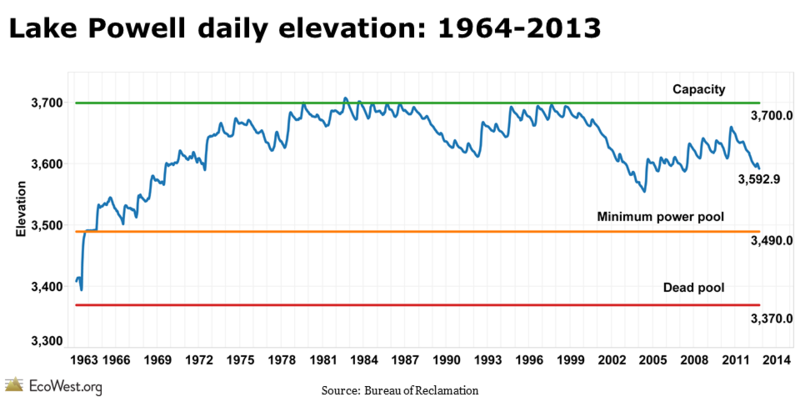 In the screenshot below, I’ve zoomed in on the United States and selected interannual variability (how much the water supply varies year to year). This risk factor is generally much greater in the West than in the East, and especially high in the Southwest. The numbers in circles indicate how many water-related media stories are currently showing up in the map’s built-in news feed. 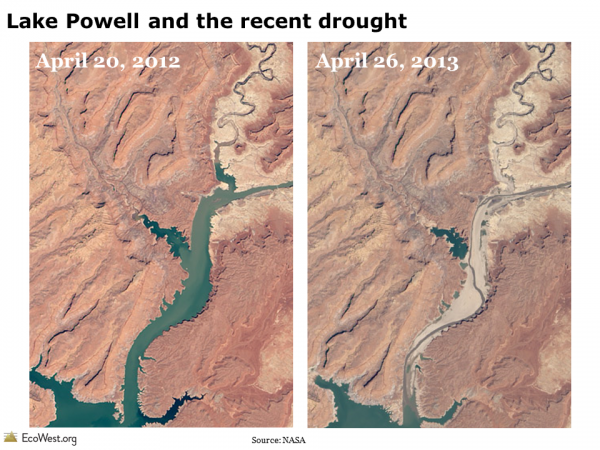 Water scarcity is one of the defining issues of the 21st century. 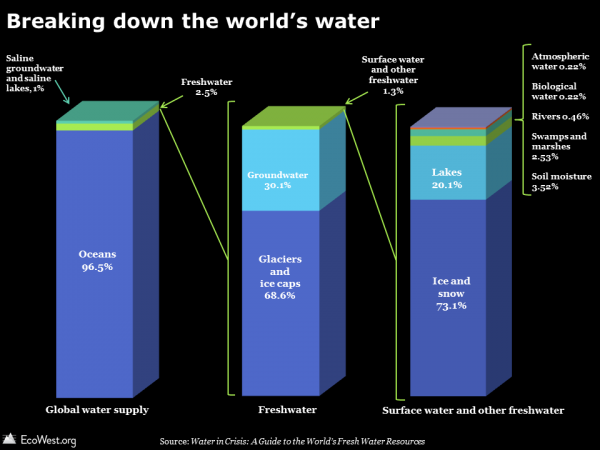 In its Global Risks 2013 report, the World Economic Forum identified water supply crises as one of the highest impact and most likely risks facing the planet. 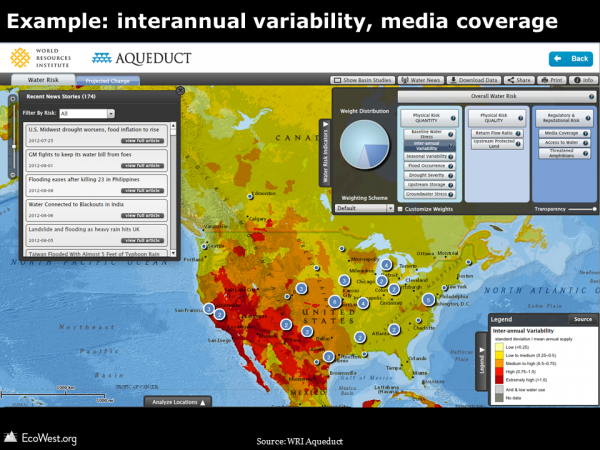 With the support of a diverse group of partners, the World Resources Institute built Aqueduct to help companies, investors, governments, and communities better understand where and how water risks are emerging around the world.In January 2013, the World Resources Institute launched the centerpiece of Aqueduct after a three-year development effort: the Water Risk Atlas. 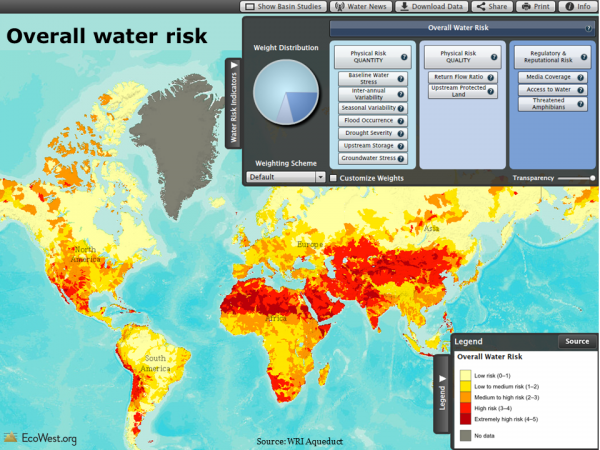 The Atlas uses a robust, peer reviewed methodology and the best-available data to create high-resolution, customizable global maps of water risk. The Aqueduct Water Risk Framework brings together 12 indicators into three categories of water risk and an overall aggregated score. 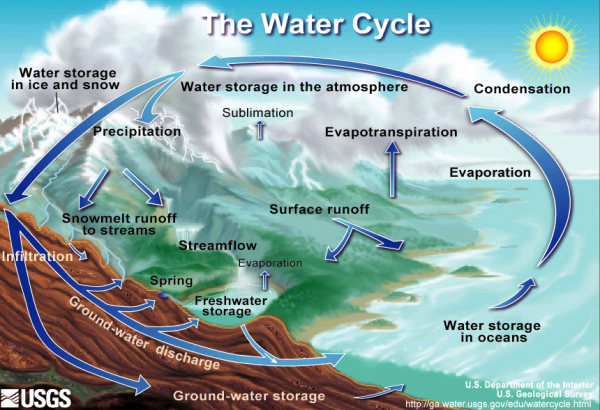 The framework is based on a thorough review of the literature and available global data, and includes several indicators developed exclusively for Aqueduct. It is structured, in particular, to help companies and investors understand indicators of water-related risk to their business, but is intended for all users, including government and civil society to better understand geographic water issues. 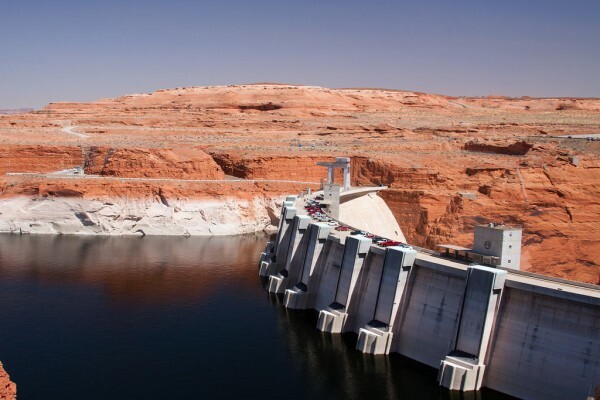 The Aqueduct Alliance, founded by General Electric and Goldman Sachs, is the network of companies and organizations that support the Aqueduct project. These partners provide resources as well as expertise and perspective to the project. One illuminating feature of the atlas is that it allows you to examine water stress–essentially the imbalance between water supply and demand–under current conditions and three IPCC climate change scenarios. 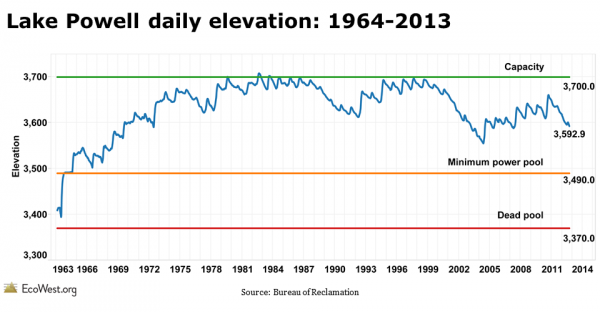 As you would expect, there’s a lot more stress, water-wise, in Phoenix than Portland. 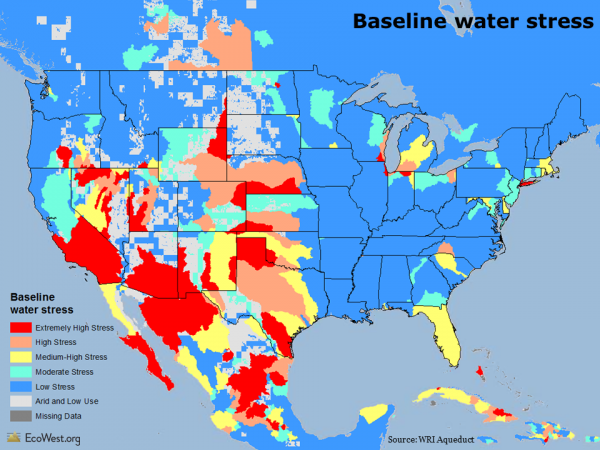 The roots of some age-old intrastate water conflicts show up pretty clearly, such as lower water stress in California’s wetter north, but extremely high stress in the drier south. 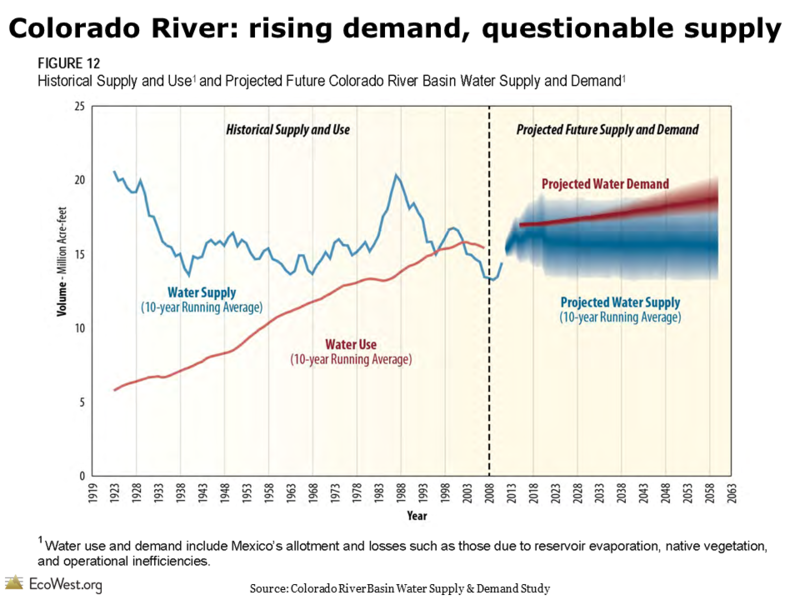 There are similar dividing lines in Colorado: most of the water is on the Western slope, but the bulk of the population is east of Continental Divide along the Front Range. 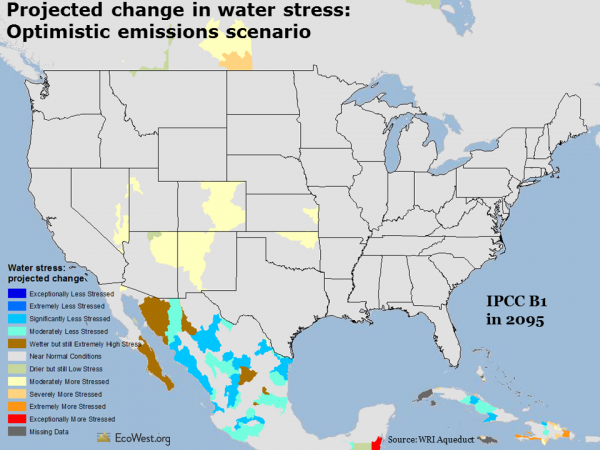 The maps below look ahead to 2095 and depicts projected changes in water stress. 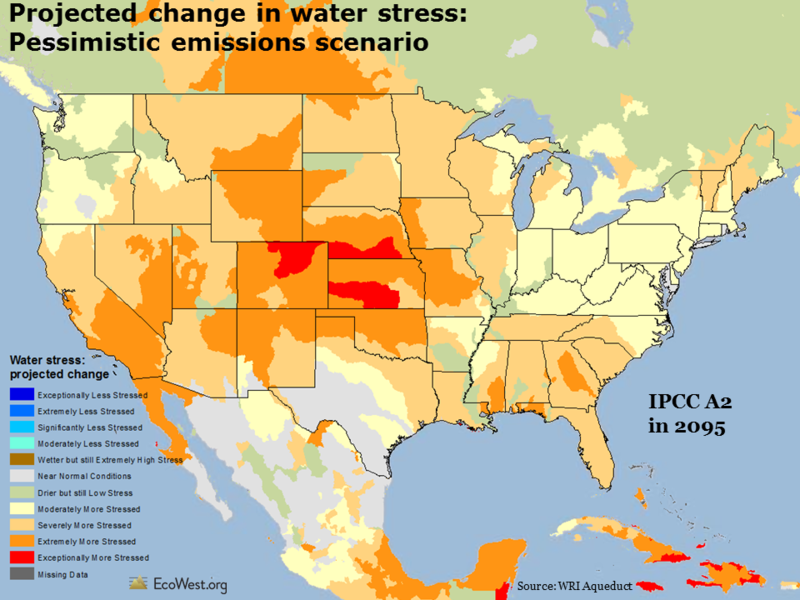 I’ve used the IPCC’s optimistic B2 and pessimistic A2 emissions scenarios, which show that higher levels of greenhouse gases will create much more water stress across the country. In the pessimistic scenario, I didn’t find any places in the continental United States where water stress decreased by 2095. 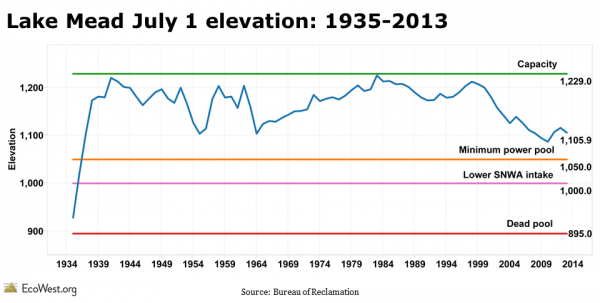 The Aqueduct atlas also has climate change projections for 2025 and 2050. It’s one of many ways you can customize your views of the data and I’d encourage anyone with an interest in water issues to take a few minutes to explore WRI’s useful visualization. 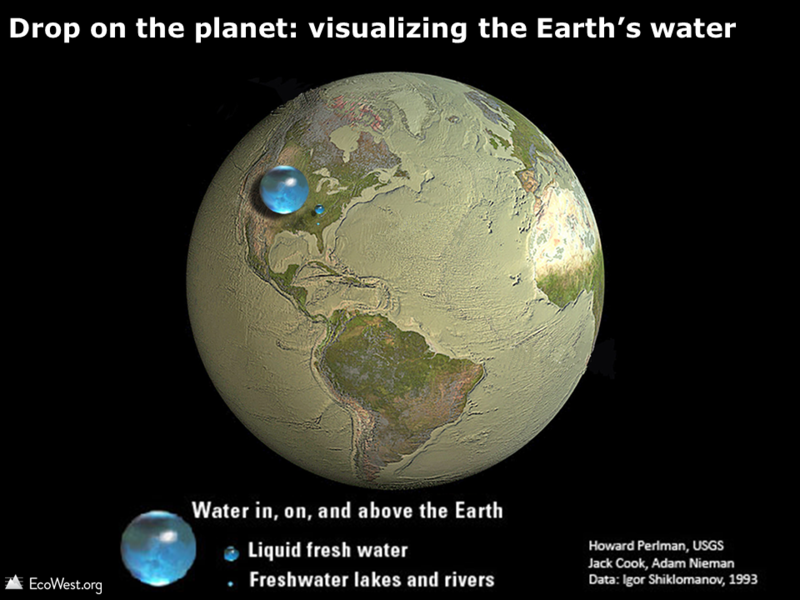 WRI provides the data for download on this page. You can also download their framework document and indicator metadata. 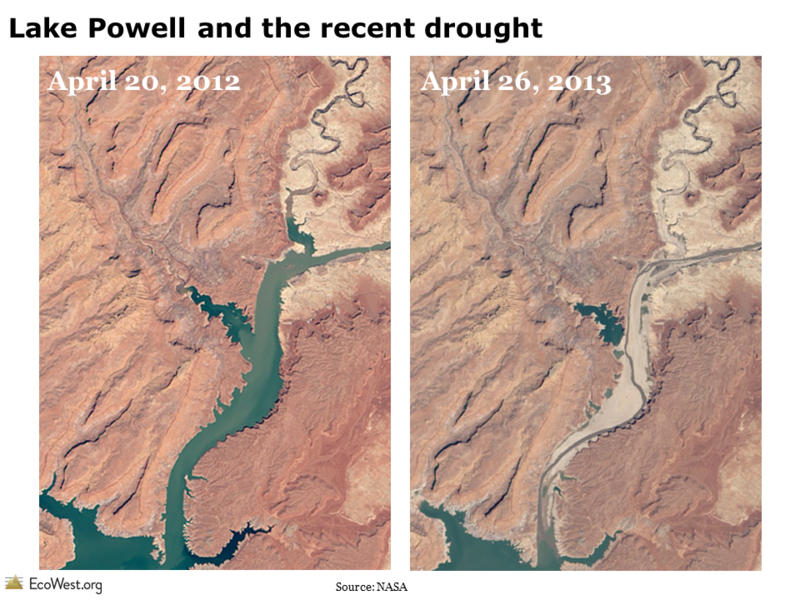 Below is an embed of their YouTube video explaining how to use the Aqueduct tool.